It seems to me that a lot of paleo snacks are sweet. Fresh fruit, dried fruit, Larabars, etc. all fulfill that need for sweet, but sometimes you just want something that's crunchy and a little bit salty. Lately I've been interested in flavored nuts as a salty, crunchy snack. I've seen several posts on Paleo blogs about dressing up mixed nuts with various spices. So I decided to try and make my own spiced nuts. The results were very good and even my non-Paleo friends were scooping them up by the handful. 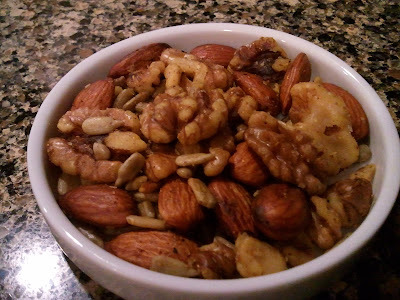 This mix contains Walnuts, Almonds and Sunflower seeds, but there are twice as many walnuts as other nuts. Walnuts are a great source of Omega-3 fatty acids, which helps to reduce inflammation in the body. So eat more Walnuts! In a skillet, toast nuts and seeds for about 2 minutes on medium high heat until they are just toasted. Mix curry powder and salt together in a small bowl and set aside. Remove toasted nuts from heat then add oil and mix to coat. Stir the spices into the nuts.